It was one of those decisions that you never have time to think through. One of those things you decide to do and then let tomorrow take care of the consequences if any! Tony is a Zimbabwean : he wears long dread locks and has a pierced tongue and lip. That is who guided me to this venture: I had made up my mind already, but I was not sure: if that is what I wanted or not. But the money had been paid and well this had to be done. Like a sheep that is headed to the slaughter house I went: up the stairs , endless stairs they were. After I had been strapped I was asked to shuffle my feet to the edge: Now, this takes like 5 minutes, It is a thing of we go we go: no hesitation, no second thoughts, no prejudices….Let us do this……..
That was not the problem: I was trying to distract my self. 4 months ago I set out on a mission to live away from everyone else I called friend, sister home, and was lucky to go live out on my own for a bit! Before I left there were loose ends to tie, bits and pieces to put together , and maybe complete the puzzle. I worked at being whole while away: Being the perfect sister, woman, girl and daughter ever, I fell short. I am human. But I lived and I am glad I did. 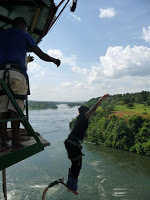 One week back into my home country I am atop a piece of board getting ready to do 44 km plunge into the River Nile. Is that bizarre or not? 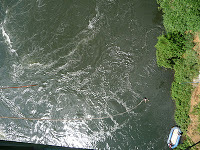 ´Bungee´ jumping it is called! That is too many loose ends to put together, I needed to focus on the task ahead. I needed to trust , that the rope would hold me and that I would be able to make it to the bottom. The plunge took happened in seconds, half the time my eyes were closed. I had to open them though so as to see where I was headed. It was one of those moments! Well I did jump and that is one thing off my bucket list: And I learned my lesson. After taking the dive: a thought came to me: I can do anything that I set my heart onto. Whether it presents itself as a challenge or an opportunity. I pray that I can be all that I want to be, that my life would reflect not only that of my creator but that I would also be good at what I do! I read something informative like this. Keep up the good work. Will certainly come back to read more of your blogs. bungee jumping is on my bucket list,i hope i get to do it this year.